Members of the Westport police union AFSCME Local 2080 gather outside police headquarters on May 21, 2018. 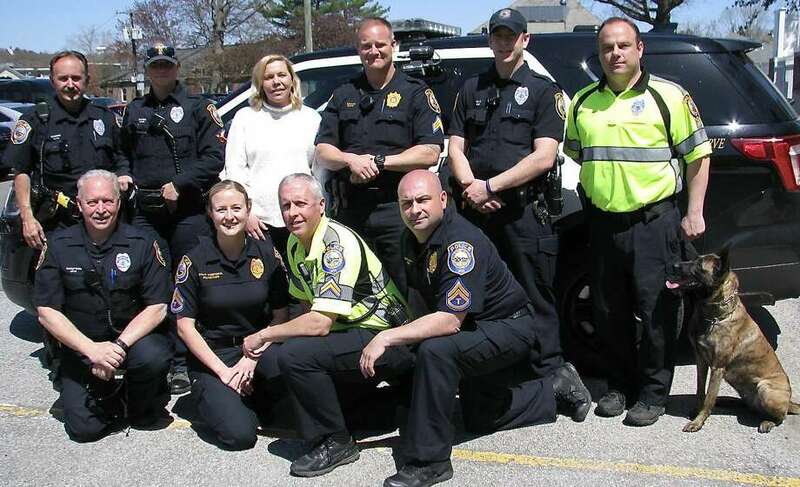 WESTPORT — The multi-year negotiation of police officer pensions came to a close with the announcement of an arbitration that largely came out in favor of the town’s proposals. “I wasn’t surprised because the decision is almost identical to what we negotiated with the fire department,” said Ralph Chetcuti, town director of personnel. Chetcuti said he believed the town would win in arbitration with the police union because the union had twice agreed to the revised pension plan over the last year, only to have the changes later voted down by the police union members. “We were pretty confident we were going to get a favorable decision,” Chetcuti said. The binding arbitration decision, released in December, sided with the town on 14 issues and the union — formally called American Federation of State, County & Municipal Employees Local 2080 — on six topics. Many of the substantial sticking points in the negotiations — a new negotiated benefits plan for new hires and survivor benefits adjusted for life expectancy — went the town’s way, according to the decision, released by the state Department of Labor Board of Mediation and Arbitration. Police employees hired after July 1, 2017, will receive a new hybrid pension plan that is half defined benefits and half defined contribution, similar to a 401(k) plan, according to the arbitration decision. Another significant change is that while the spouses of retired employees currently pay 40 percent of their health insurance costs, they will now have to pay for the full amount of these costs, per the arbitrator’s decision. Union President Cpl. Howard Simpson did not return calls for comment on the arbitration decision, but told the Westport News in May that the town is in great financial shape and officers are frustrated with decreased spousal benefits and cost of living adjustments. Employees hired after July 2017 will not receive a cost of living adjustment and the COLA for employees under the age of 20 will be capped at 2.75 percent, while officers over 20 can still receive a COLA of 4 percent, the arbitrator decided. The new COLA is more in line with the two percent COLA of most area municipalities, town labor lawyer Floyd Dugas said. “The town’s annual cost for pension and retiree health care skyrocketed from under a million (dollars) to nearly 20 million (dollars) a year between 2010 and 2018,” Dugas said in May. The town is expected to save the town $40 million over the next 20 years. On Jan. 8, the Representative Town Meeting voted 31 to 1 not to reject the arbitrators decision, which will be in effect for police pensions until 2024.